A South African microroastery with one foot in Scandinavian tradition, makes for a truly unique coffee experience. The first time I ventured down the steps to see the pristine white walls and minimalist laboratory style décor of Espresso Lab Microroasters, I might’ve used the word clinical, but for the huge smiles and cries of “Iain! Welcome back, man!” from the cheerful Vuyo and Jeremy greeting Iain, a Durbanite who visited every couple of months, by name. 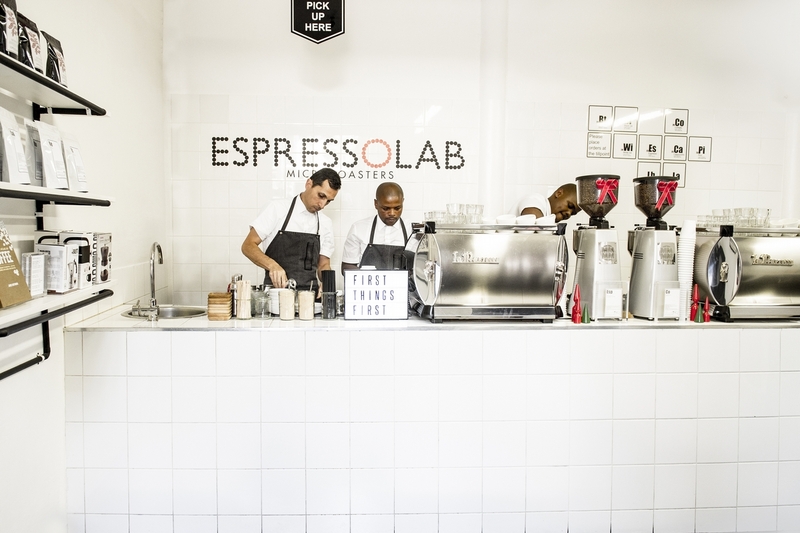 In 2012 when this publication began, Iain was flabbergasted that I had not been to Espresso Lab Microroasters and on our first business trip to Cape Town, that was rectified and I was properly educated. I was playfully berated by Lydia for ordering a cortado (they're so good though!) and promptly treated to a trio of alternative brews, strictly no milk. Three different coffees, three different methods. We were extremely grateful and our taste buds were delighted. 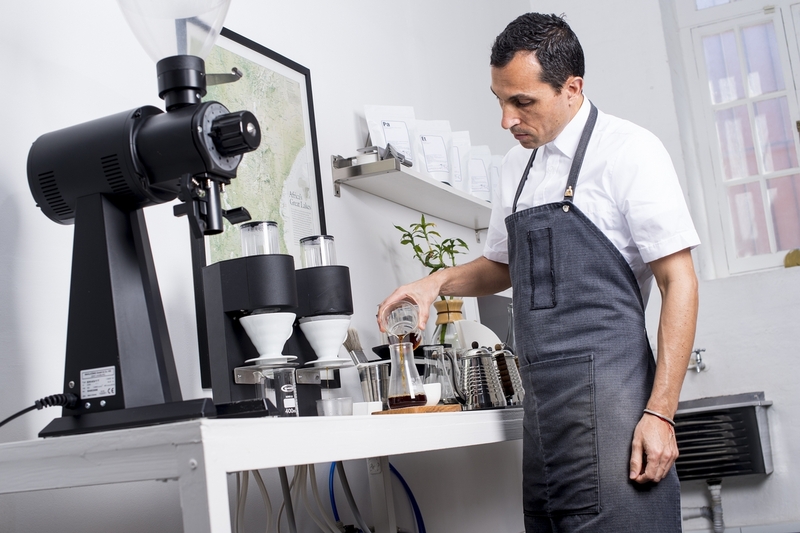 Renato Correia, co-owner with his dynamic other half Helene Vaerlien, is a student of coffee and a master of roasting. Each batch roasted is art. Renato has been influenced by the Scandinavian led trend to roast coffee to a very light degree to highlight certain attributes of the beans. Their standards are extremely high and each barista takes pride in providing its patrons with the best possible coffee experience. One of the important qualities of the team is that they are always working on improving. There is no end to the learning. And their attention to detail is OCD to the extreme, in the best possible way. Before they had their Mahlkonig EK, their vacuum was always kept close to the grinder to get rid of coffee particles between brewing the various single origins. I kid you not. So when you visit Espresso Lab, don't order what you normally have at a café, let them rather take you on a journey and be blown away by something you've never tasted before. We asked Renato and Helene to give us a bit of insight into their operation. How did Espresso Lab Microroasters find it’s beginning? Well, not sure how many pages in your publication you have, as this is a rather long story, but the short version is that we moved to Cape Town to find a city with great potential in the coffee sector. When we opened there were only a hand full of coffee roasters, with only one serving specialty coffee, and nobody showcasing a flavor profile that we had been exposed to in Scandinavia, and we knew we did not want to emulate an Italian taste profile, as we had lived in Italy for sometime and been exposed to that industry at great lengths. So we set out in 2009 to showcase light roasted coffee with a sweet high fruit acid taste profile, always chartering our own way, hopefully contributing to a diverse coffee community. 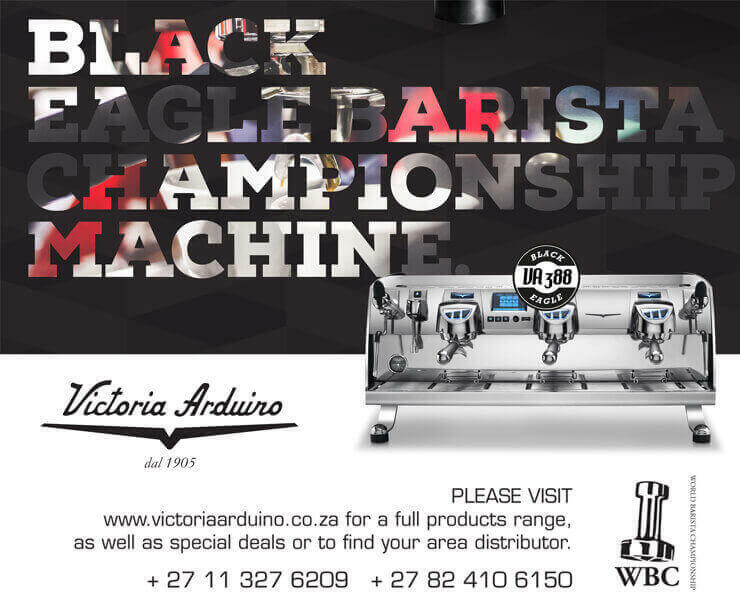 You were, and remain, ahead of the coffee curve in the South African industry and have never wavered from your quality standards. Was it challenging to introduce South African coffee drinkers to a forward thinking way of consumption? It has been challenging at times, but it has never deterred us from doing what we believe in. Too often in coffee, business owners say, “my customer won’t like that”, but if you do not introduce your customer to anything new, things will never progress. You have to always be a step ahead of the consumer. Ferran Adria, award-winning chef, said that once your customer completely understands what you are doing, you are already behind the curve. It’s our professional duty as coffee specialists to expose consumers to new and exciting coffee flavors, even if at the risk of not everyone liking what you are trying to showcase. As one of the few roastery’s in the country that can truthfully say you serve all specialty coffees, what is Espresso Lab’s criteria for choosing a new coffee to showcase? Quality. We have never compromised on that, even when it’s sometimes to the detriment of our bank balance. We also trying to go further, offering not only Single Estate coffees, which we have done since day one, but also offering single varietal Estate coffees. This basically means farmers are not blending varieties at farm level and offering us roasters the opportunity to showcase the unique flavors of terrior and varietal from a Single Estate. We also try to purchase from the same estates year after year. This gives the farmers financial assurance, supporting them year after year, even if some years the coffee may not be as good as the previous year. Buying coffee at times can be described as a roller coaster, you have to ride the highs and the lows, not only in quality, but also in price. Why do you believe that it is important for the consumer to know the stories behind the beans you source? In today’s commercial consumer society, people have no idea where most things come from, which is quite frightening. We are disconnected from what we eat and drink. We believe the more you know about a coffee, where it has been grown, when it was harvested, which process it has been through, etc the more you will be able to enjoy it and converse about it, hence enhancing the image of specialty coffee. The more we can teach our customer, the better they can make an educated decision when they buy coffee, weather it is from us or anywhere else. Knowledge is power afforded to the consumer, forcing those cloak and dagger coffee roasters to be more open with their offerings. Espresso Lab must have one the lowest turnover of staff I’ve ever seen in a café, which I deeply respect and as a customer, really appreciate. We only get to visit once every six months but still receive a warm welcome by name and an exceptional coffee no matter who makes it. What do you look for when you take on new team members? Having worked in hospitality for all our professional lives, the formula is easy, happy staff = happy customer. We ask a lot of our staff but we also give a lot back, so it is a relationship based on mutual respect and appreciation for each other. We have a lot of respect for our staff and see them as one of our most valuable assets. Often in the coffee industry we are dazzled by the bling of a coffee machine, but to us, what impresses us is a blinging smile. Our staff are the faces most customers’ meet when they come to the shop, so they are vital to our survival as a business, and we treat them as such. We often ask them for their input on decisions, which affect the day to day running of the shop. We also try to always laugh and have fun at work. We take what we do very serious, but not ourselves. We make sure we laugh together every day. When we first opened and in many cases still today, a barista was seen as a minimum wage job, “just” a guy or girl behind the espresso machine, which could not be further from the truth. Salaries in the coffee sector are far too suppressed, and we are trying our best to change this. Tell us about the SP9 competition experience and why you think this piece of equipment will compliment your brewing philosophy and make a difference in your establishment? Wow, winning the Marco Beverages SP9 coffee brewer was one of the toughest challenges we ever undertook in our short history as a company. It was hard work, involving many a late night and early morning campaigning. Actually, we had come across the Marco SP9 earlier this year when our friends Charles and Anne from Koppi in Sweden had one installed in their cafe. When we looked into the machine, and its performance, we knew it would be a great addition to our shop. We feel that filter brewed coffee is one the best ways in tasting coffee, as it is the purest way. It is something we have served here for a long time, but as it is a time consuming process, and challenging one at that, it is something we were not able to offer our customers on Saturdays. When Marco announced the competition to win an SP9, we knew it was a chance of a lifetime for our business. We submitted our essay on why we thought we should win it. When we were chosen as one of only five finalists worldwide we were ecstatic. It was then that the hard work started. We connected with every single customer that came through our doors, as well as trying to come up with fun and inventive ideas to get people voting online. Together as a team, Vuyo, Tshebase, Lydia and Eva worked tirelessly to get people voting in the shop and to tell their friends and families. From the start, we wanted our campaign to reflect both the amazing equipment we wanted to win as well as our personality. The outpouring of support has really been overwhelming, not just from our customers, but many of our old friends from abroad who gave us a huge online support. It’s been an amazing experience, and we are so grateful to Marco Beverage Systems for this opportunity in bringing this world-class coffee brewer to Africa for the first time. The following are our suggested formulas when brewing coffee at home. 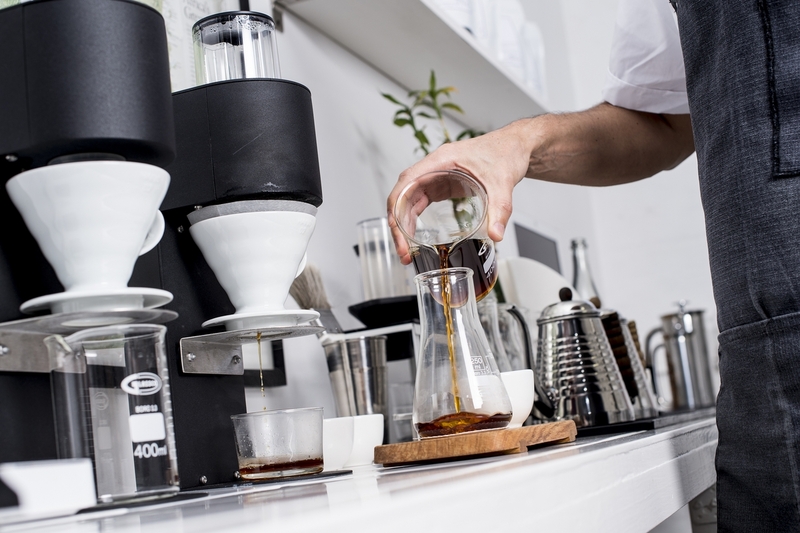 There is no exact science to brewing a good cup of coffee, but using filtered water, freshly ground coffee, weighing your coffee, using the correct amount of water and controlling the brew process almost guarantees a perfect cup. More importantly, brewing coffee is a process which takes time, patience and a sense of purpose. Enjoy it. 1. Insert the filter into the ceramic cone and pre wet the filter paper. 2. Bring approx. 400ml of water to the boil, preferably 90-95C. 3. Weigh the coffee, 24g - for approx. 2 cups. Pour into the filter. 4. Sit the ceramic cone over appropriate cup. 5. Pour approx. 50ml of water over the coffee grounds with the spouted pitcher and allow to bloom for 30-45 secs. 6. Pour the remaining water in a slow circular motion until a total of 400ml has been reached. The total brew time should be 2-3 minutes. 7. The coffee is now ready to serve - enjoy.